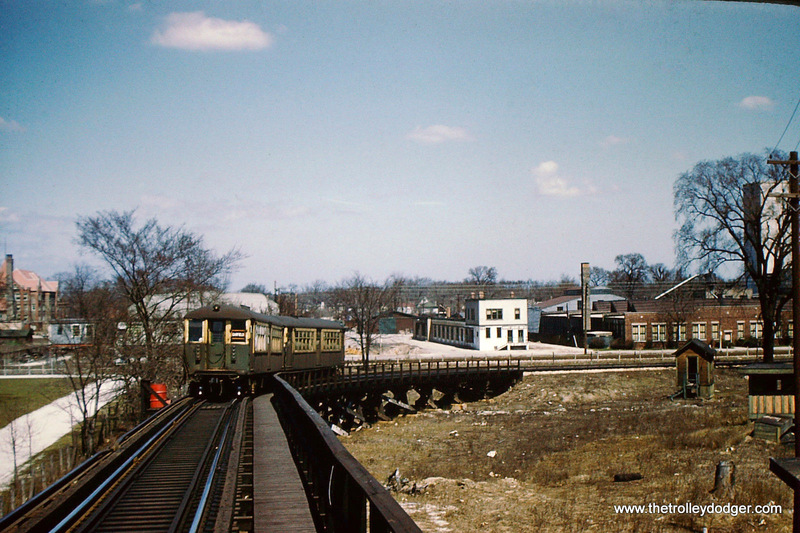 Photos of the old Humboldt Park “L” branch are quite rare. 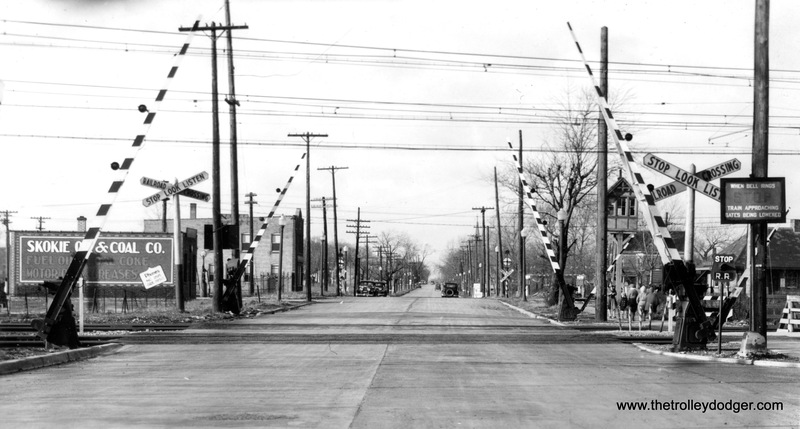 This photo looks west from Western Avenue on January 26, 1931. 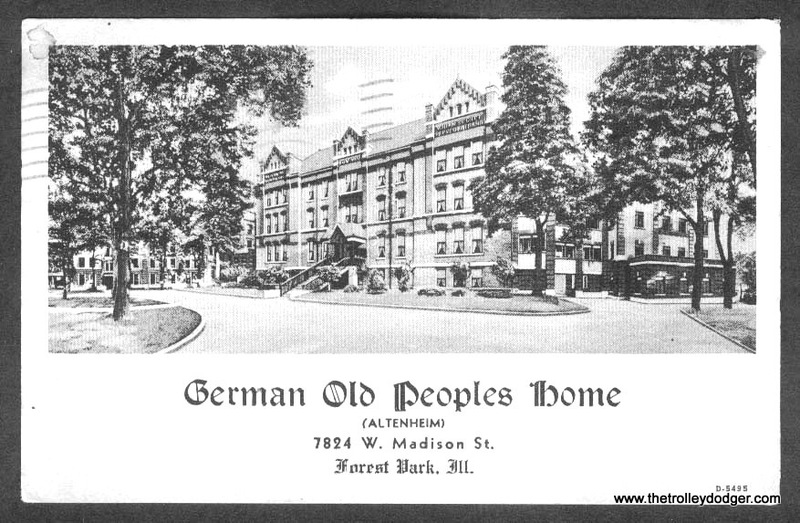 This branch closed in 1952, although portions of the structure remained into the early 1960s. 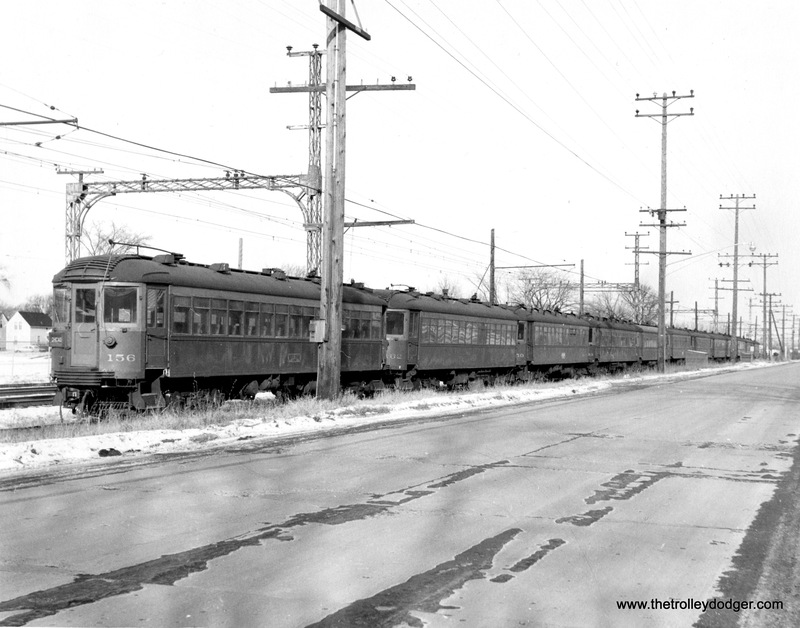 This shows TMER&T 1121 running on a 1949 fantrip on the North Shore Line at the Kenosha station. 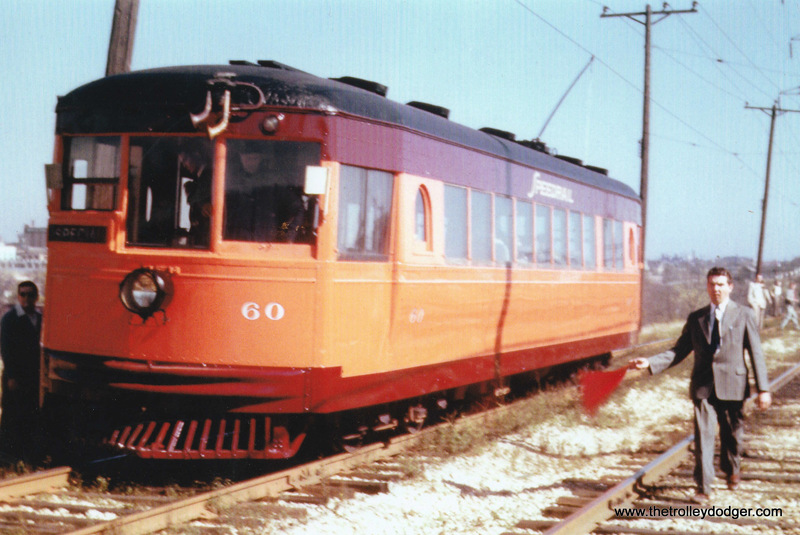 We ran a similar picture in our previous post Traction in Milwaukee (September 16, 2015). 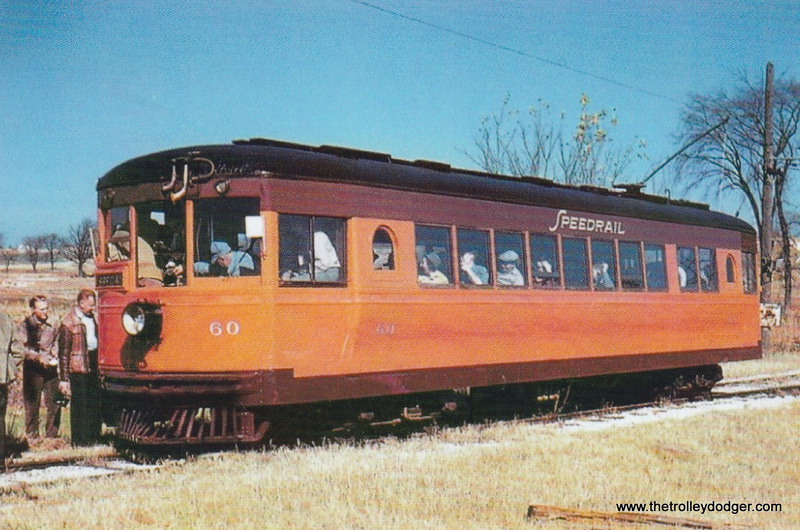 Speedrail car 60 at the Waukesha Quarry, date unknown but circa 1949-51. 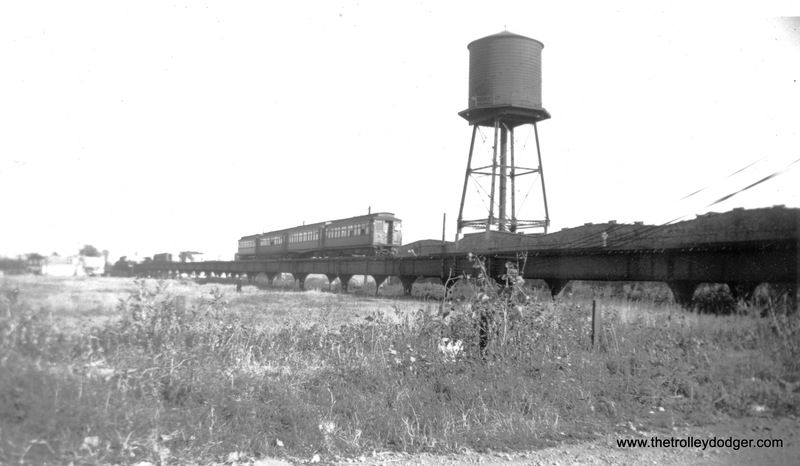 The photo of Speedrail car 60 in your latest postings at the Waukesha Gravel pit was taken on 10-16-49. 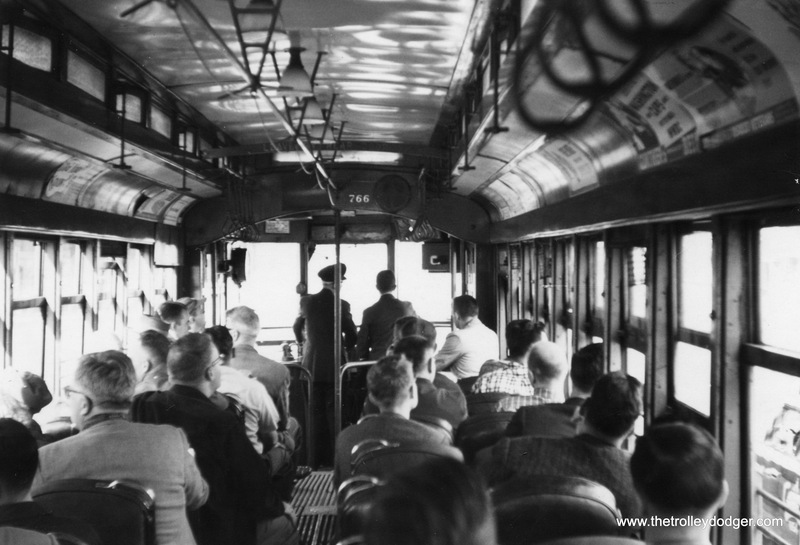 The occasion was the inaugural fan trip using a 60-series curved side car. 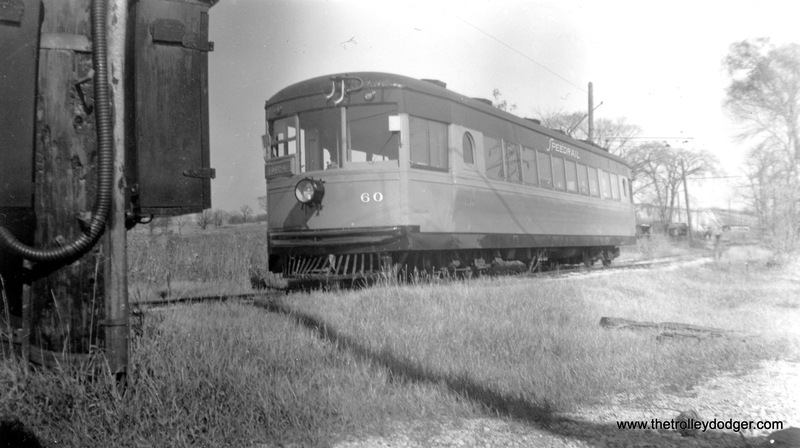 It was sponsored by the short lived Milwaukee Division of the Electric Railroaders Association and was run by Milwaukeean James P. Harper who authored CERA Bulletin 97, “The Electric Railways of Wisconsin” published in 1952. 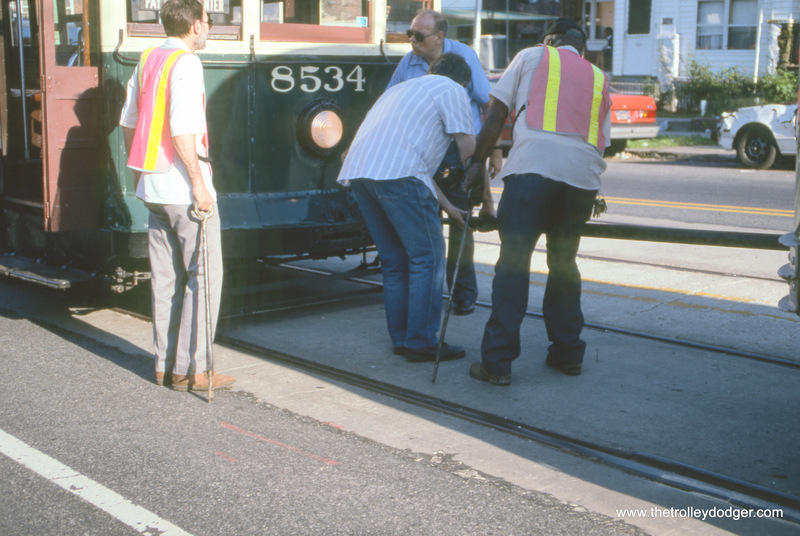 At the start of the private right-of-way at 8th St., the motors on the rear truck began having problems. At Waukesha, the car pulled onto one of the 2 side tracks leading back into the gravel pit. 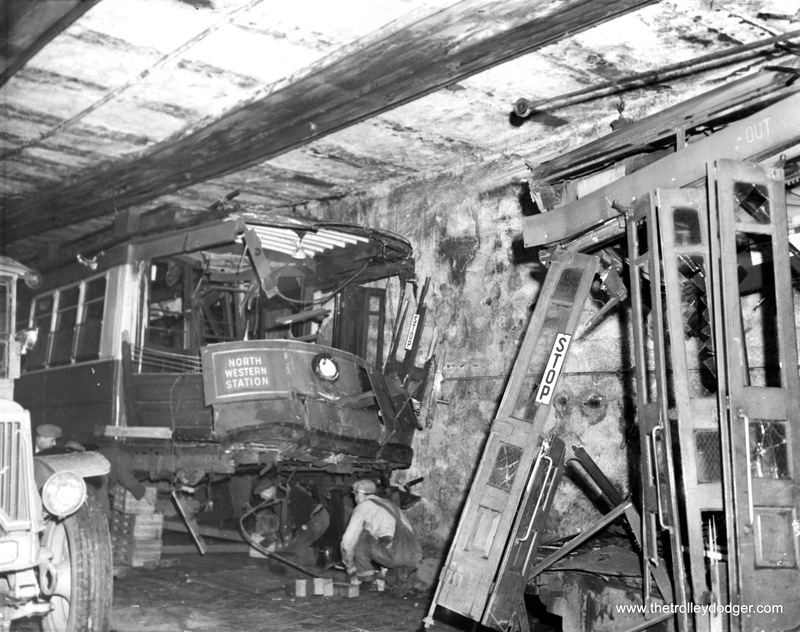 George Krambles accessed the rear trucks via a panel in the floor and disconnected the motor leads to the troublesome rear trucks. From that point forward the car ran on only 2 motors for the remainder of the fan trip. 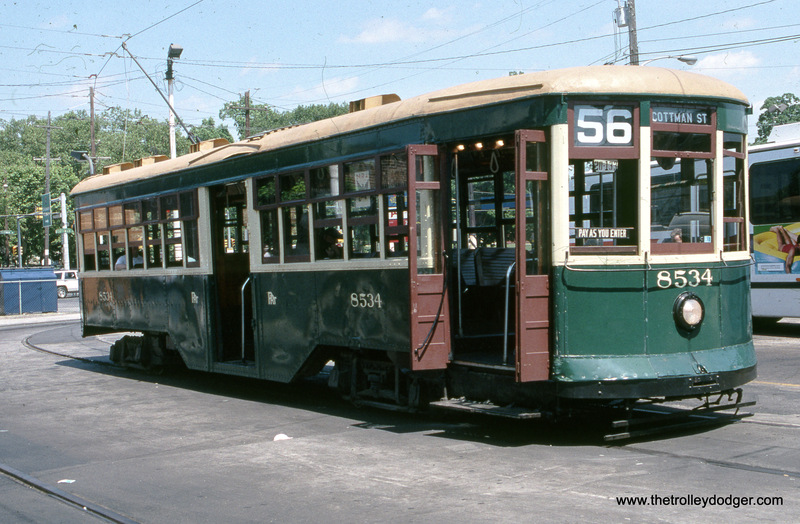 Car 65 had been the car originally intended to do the trip, but it was down with mechanical problems of its own. This caused the trip to be postponed for a week and the substitution of car 60. 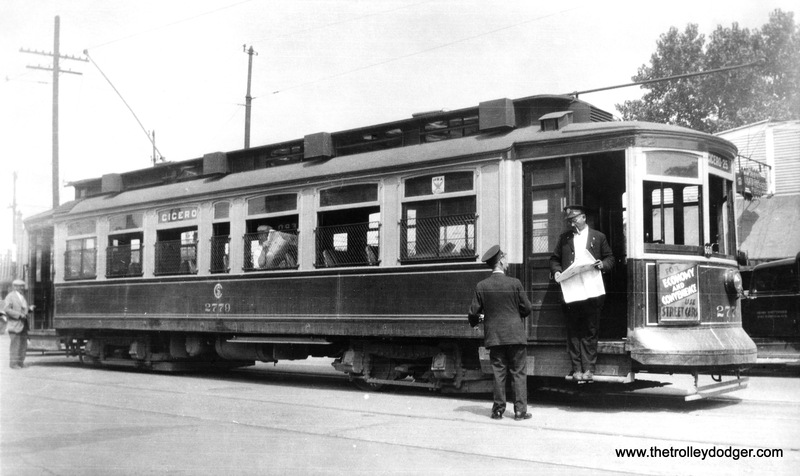 When the car pulled into gravel pit siding one of the fans on board remarked, “Wow, look at this. They’ve got it in the scrap line already!”. 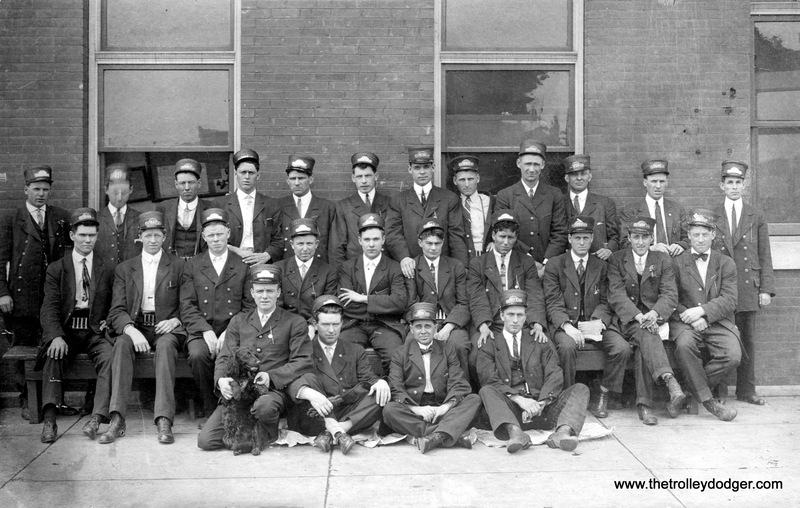 In addition to George Krambles, Al Kalmbach was on the trip, as was well-known railfan and photographer Barney Neuberger. 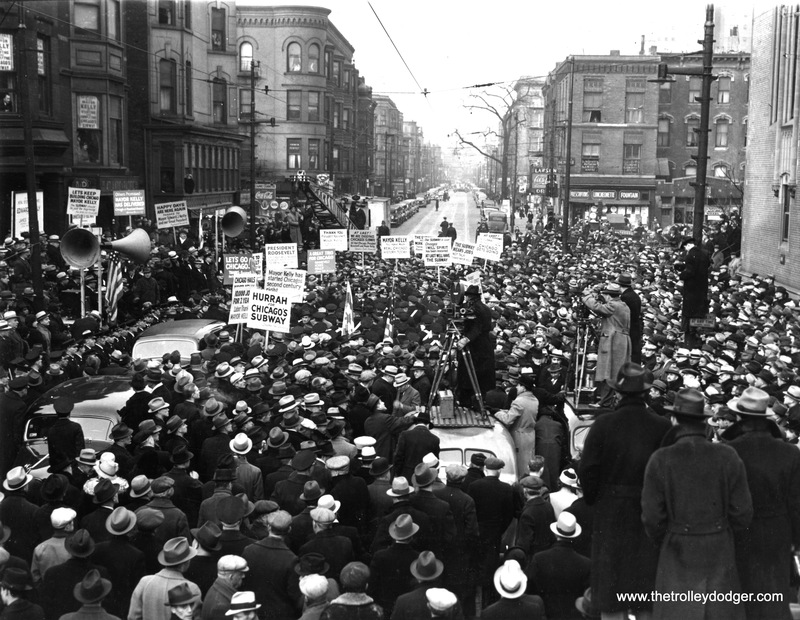 He can be seen siting in about the 4th row of the car on the left side wearing a pork pie hat. I’ve attached a few items related to that fan trip including a photo of Jay Maeder walking alongside car 60. This was taken at the first photo stop which was 44th St. where Milwaukee County Stadium would be built starting a year later. Car 60 was doing a photo run-by by backing down the line. The fans formed a photo line facing the car. Philadelphia Peter Witt 8534 in July 1996. 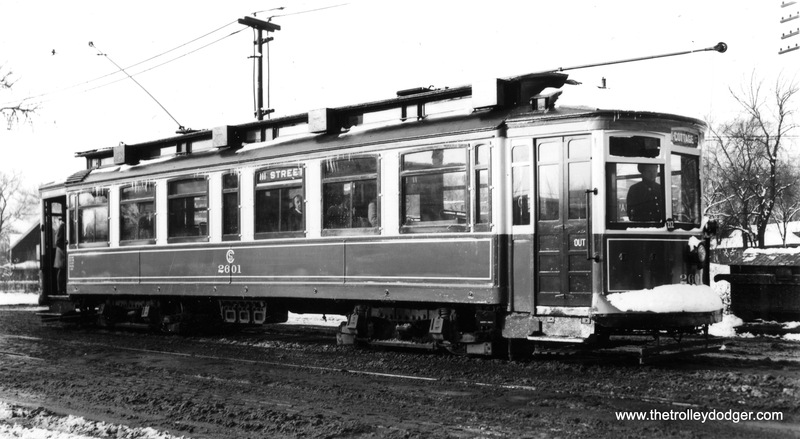 Don’s Rail Photos: “8534 was built by Brill Car in 1926, #22353.” It is part of the Electric City Trolley Museum collection in Scranton, PA. 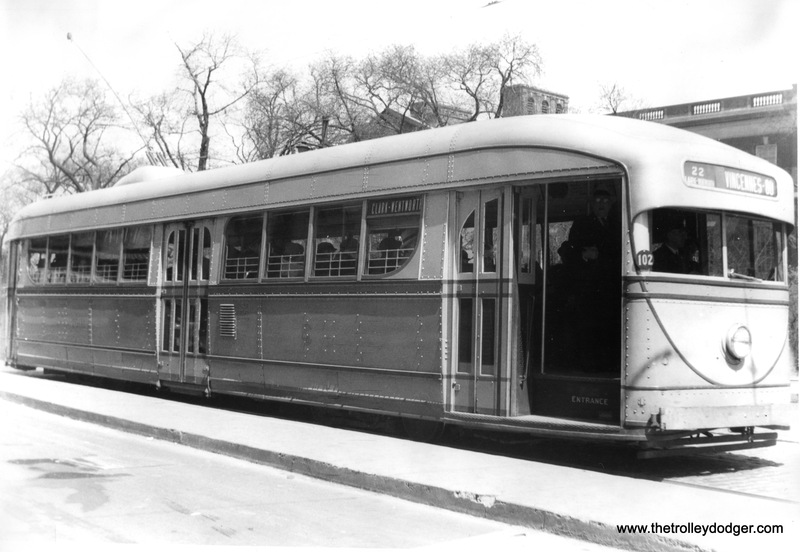 Here, it is shown in Philadelphia, during the time it was leased to SEPTA for trolley tours. 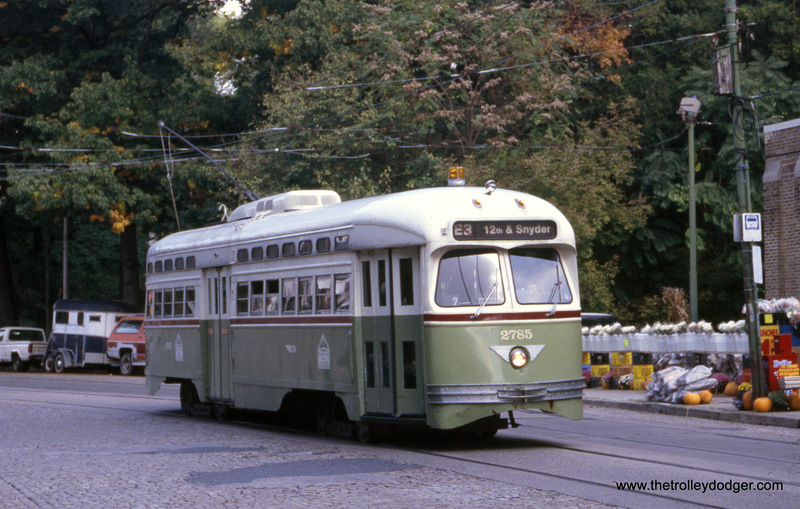 SEPTA 2750 and 8534 on a fantrip in August 1996. Apparently 8534 has broken down and is being towed. 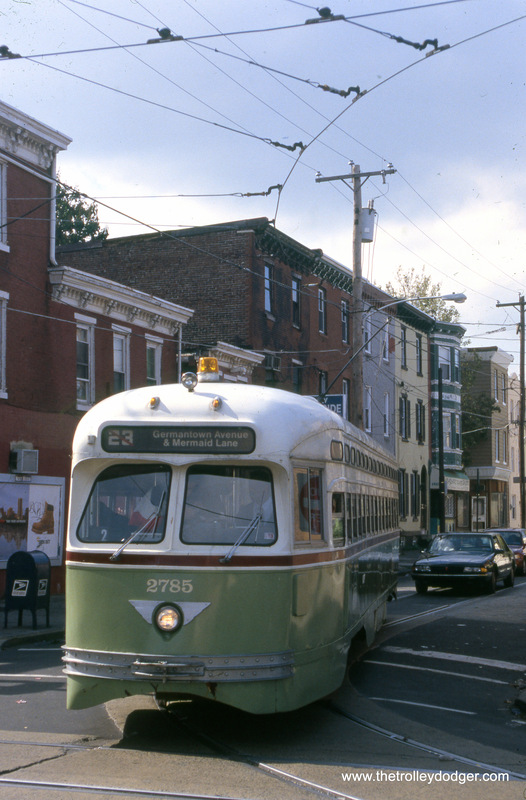 SEPTA 2785 in November 2002. 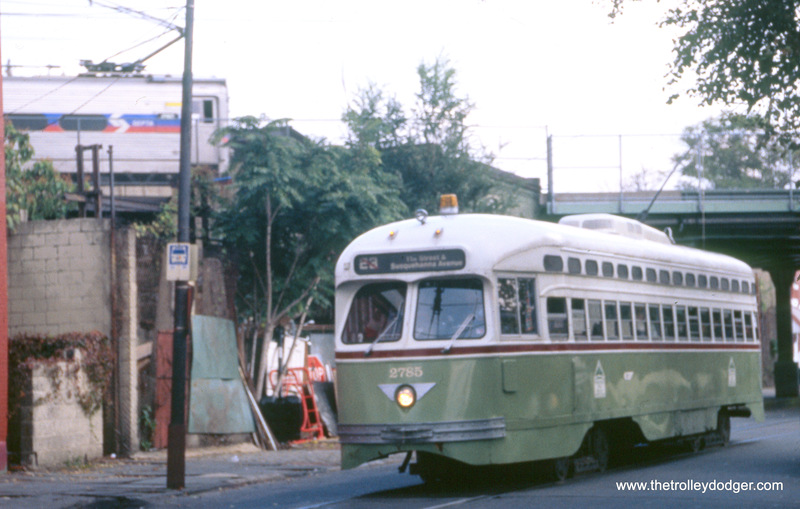 SEPTA 2750 and 8534 in August 1996. 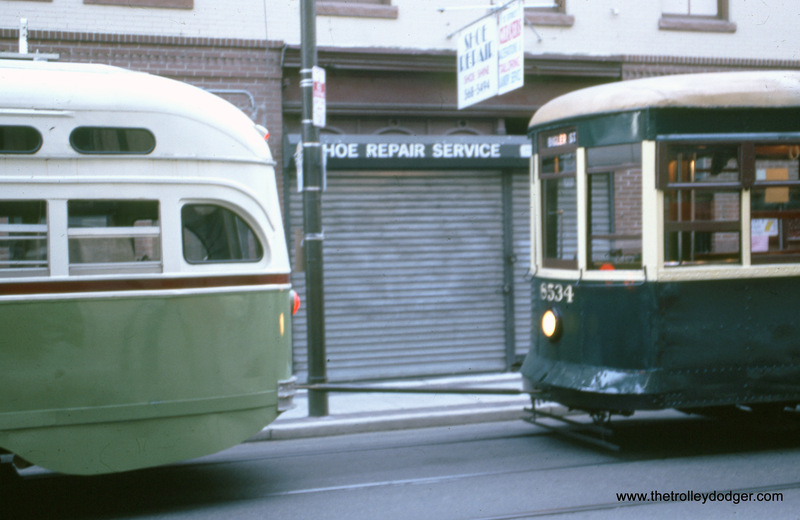 Three generations of Philadelphia streetcars in May 1999. SEPTA PCC 2785 on the truncated route 23 in November 2002. 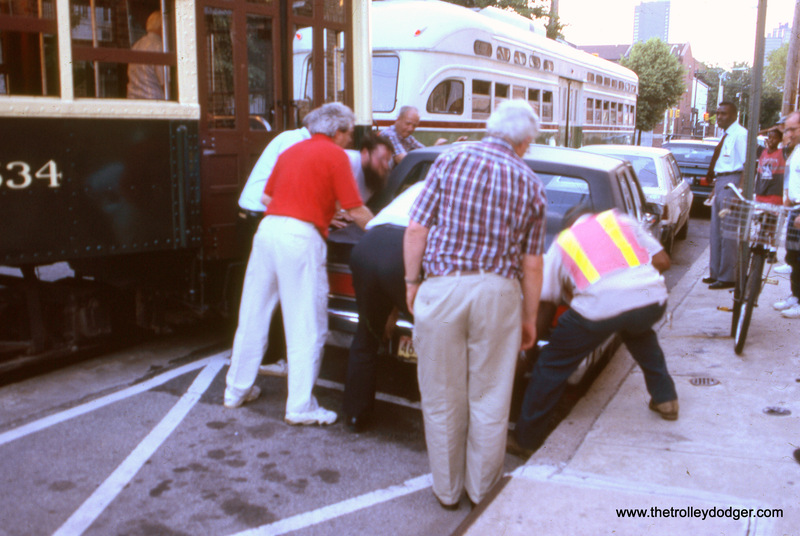 The fantrip train is having trouble clearing this auto in August 1996. Looks like an attempt was made to move the offending car out of the way. August 1996. 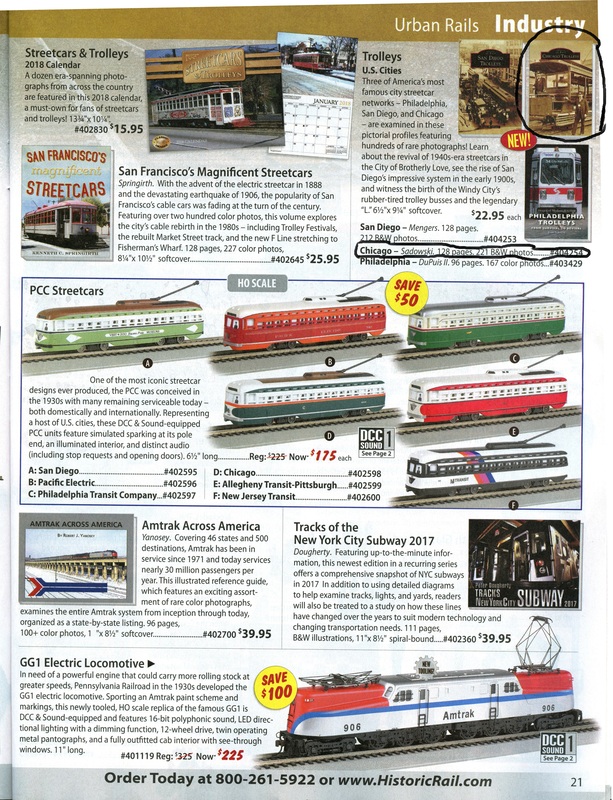 Look who is in the new HISTORIC RAIL & ROADS catalog! Your book arrived and it is JUST AWESOME. I am completely taken by some of the imagery, and of course enjoy the way you seem to simplify historical writing. VERY nice work!! THANK YOU!!! This is our 197th post, and we are gradually creating a body of work and an online resource for the benefit of all railfans, everywhere. 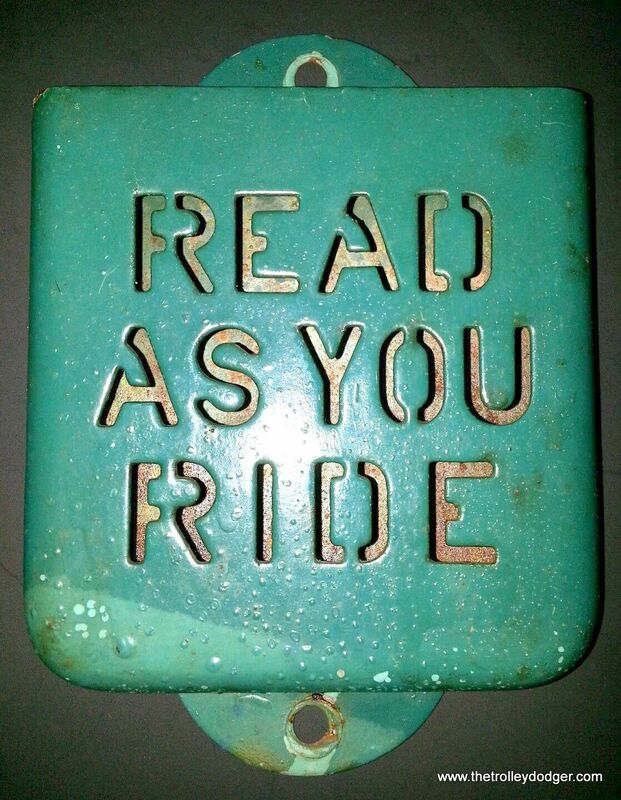 To date, we have received over 329,000 page views, for which we are very grateful. -The shot of SEPTA #2785 with the commuter train that you presumed to be in Chestnut Hill is actually approaching 11th and Susquehanna,southbound, a cut-back location for which the car is signed in the picture. The commuter train would be inbound toward Center City. -The view of #8534 being “manually switched” three photos later shows 8534 being coupled to its leader (2750) after apparently becoming disabled. Several of your other photos show the subsequent towing operation. Thanks for the Humboldt Park shot. 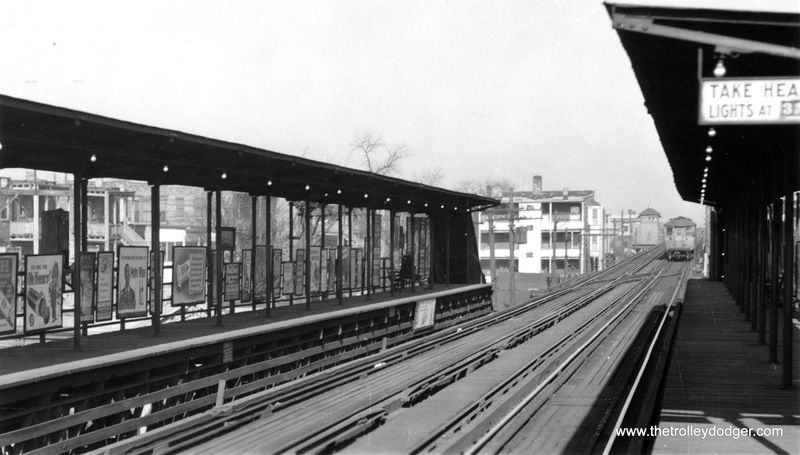 I remember as a kid seeing the abandoned line from my seat on a passing Logan Sq train. 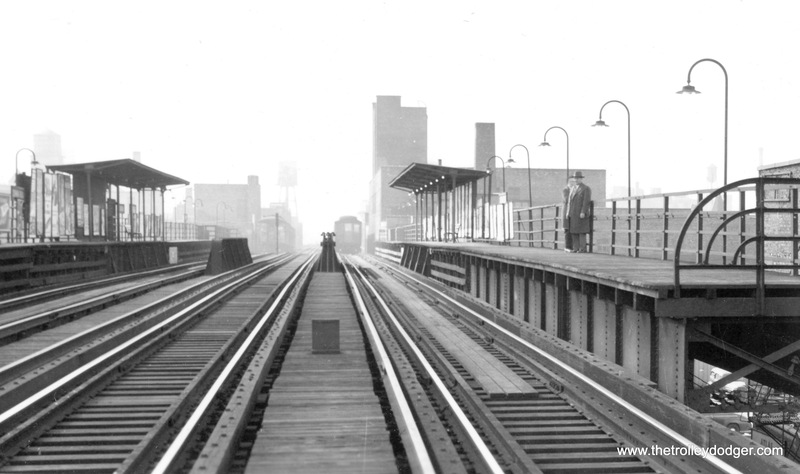 One day I decided to get off at the Damen station and walk under the tracks to see where they led to. 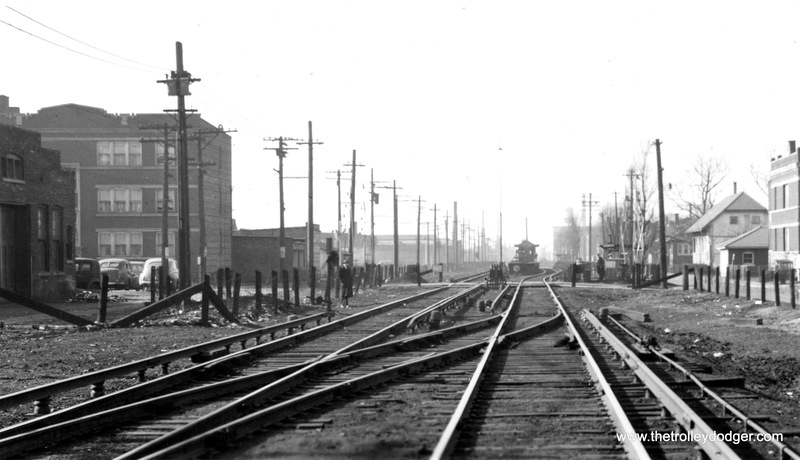 When I got to Western the tracks ended as the rails West of there were torn down. 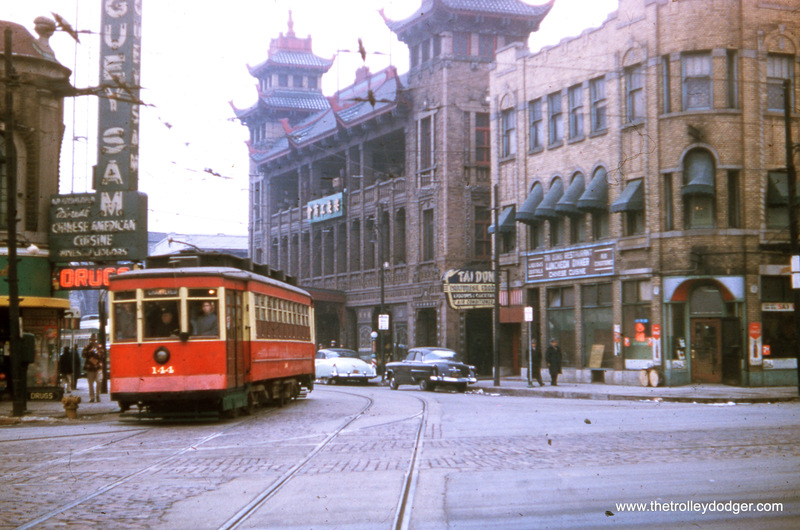 This was around 1962. 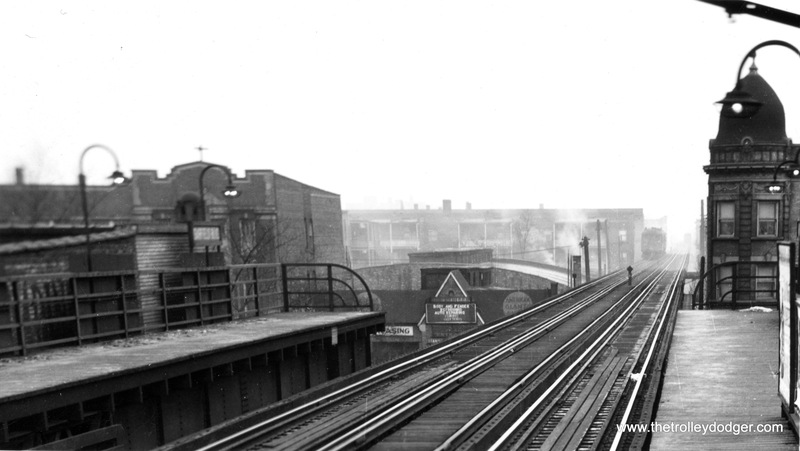 According to Art Peterson, the CTA kept about half of the Humboldt Park branch for a time as a potential location where CA&E trains could be stored, if the line had succeeded in resuming passenger service. 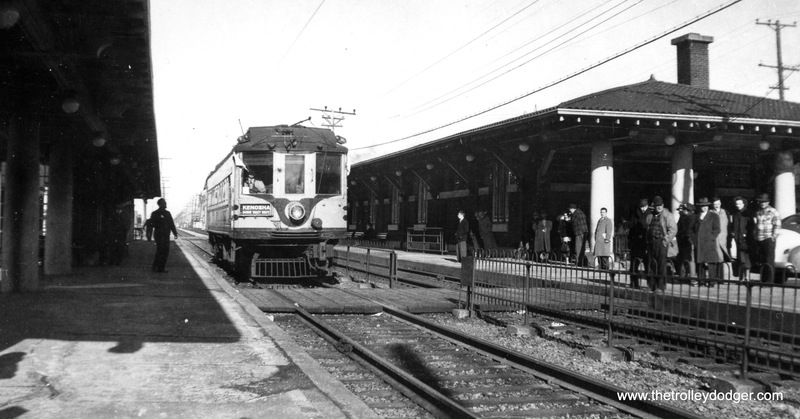 In that scenario, the interurban trains, lacking a downtown terminal, would have deadheaded to Humboldt Park in mid-day. 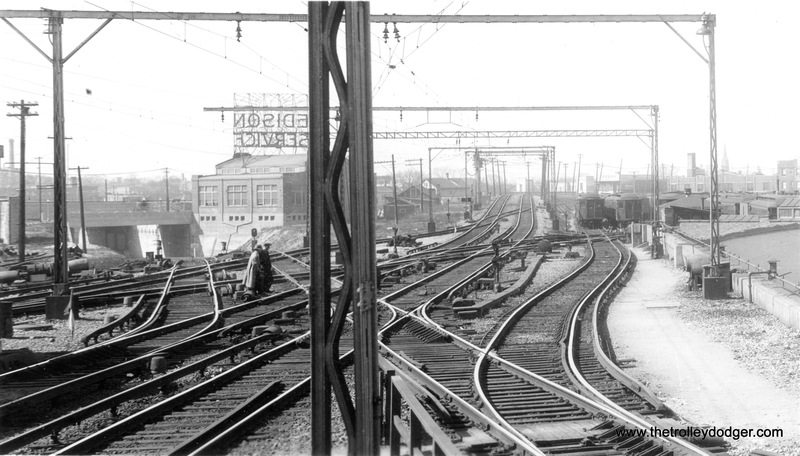 Once the railroad was liquidated, the rest of this “L” branch was torn down. 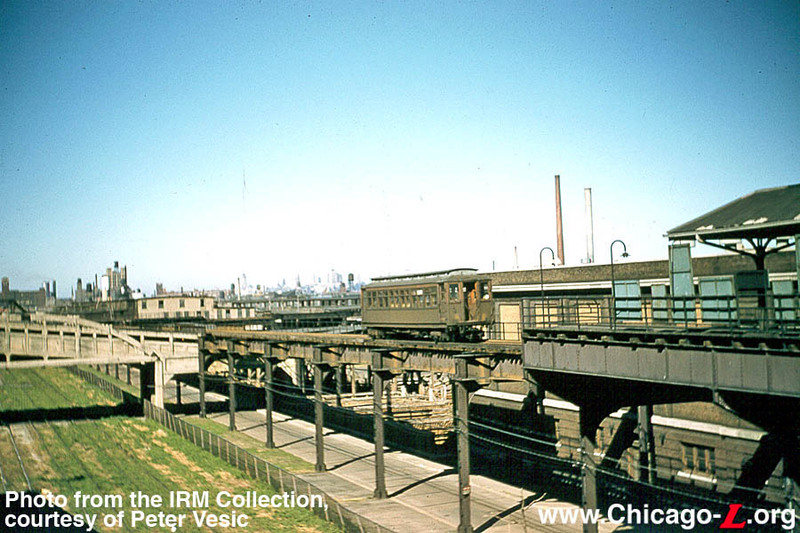 In a previous post (Highlights from The “New Look,” Part 2, December 31, 2015), we show excerpts from the CTA Transit News, indicating that this remnant of the Humboldt Park “L” was torn down circa September-October 1961. 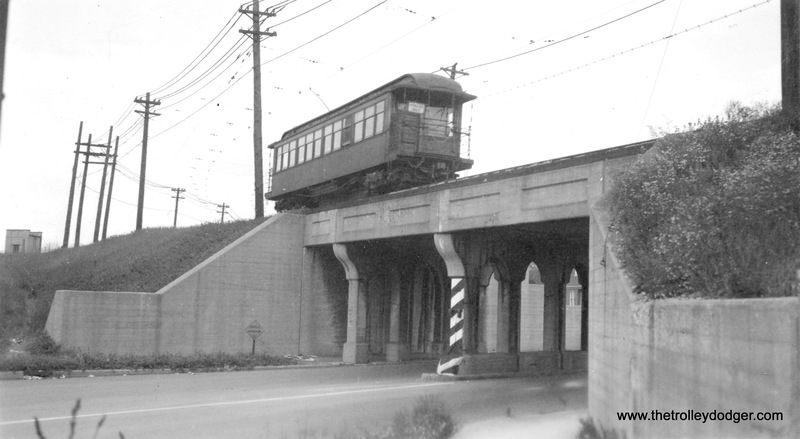 Could one assume that the Lake Transfer flyover and the tracks north to Evergreen Junction would have remained for CA&E trains, as well? What purpose would they have served? 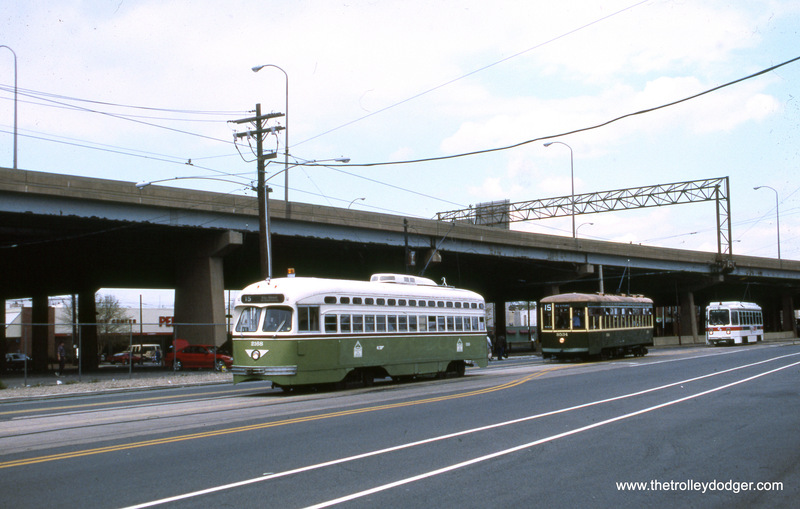 The CA&E needed to bring people downtown. 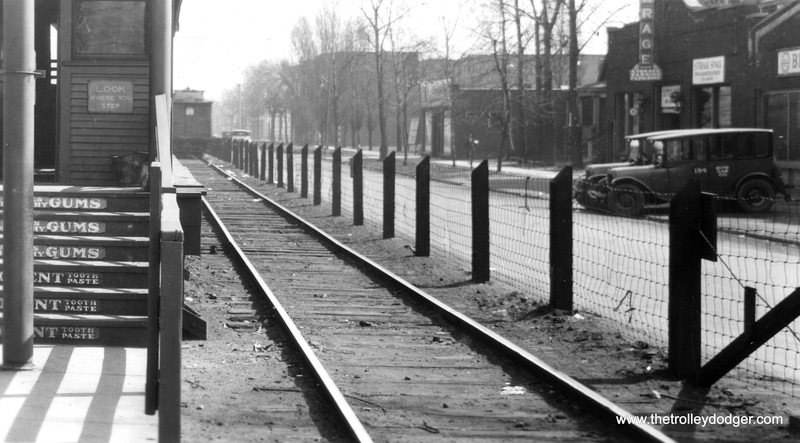 Those tracks were west of Ashland. 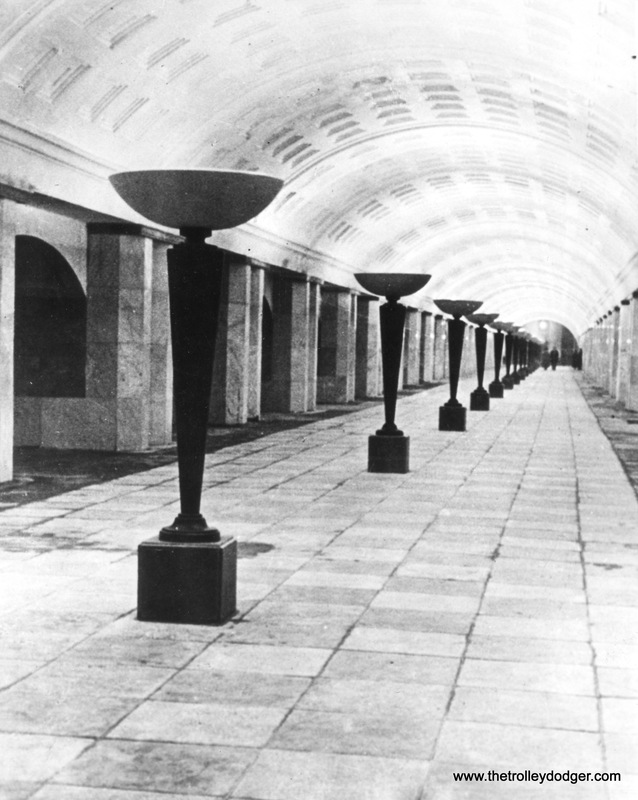 However, they did remain in place until 1964. 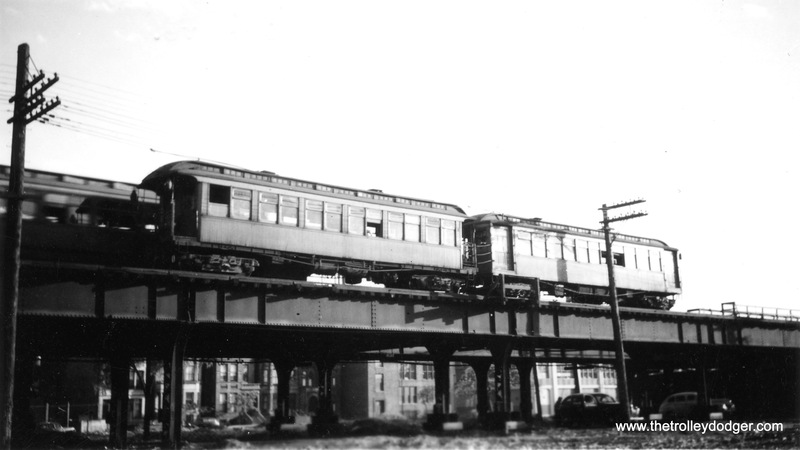 The City and CTA did have plans for many years to create a “crosstown” “L” running from 79th Street to the Kennedy Expressway, and this segment would have been a part of it. A better solution for CA&E would have been a ramp to take their trains out of the expressway median and run to Lake Street via the Paulina Connector. 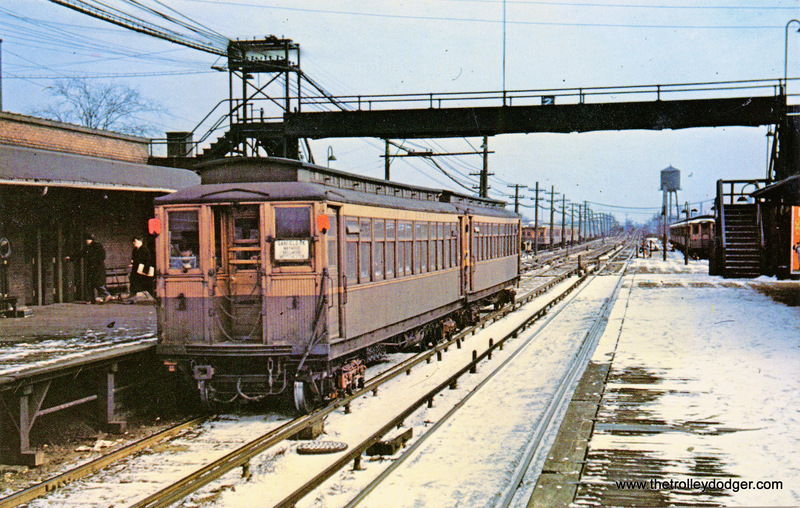 Then, CA&E trains could have gone around the Loop. The ramp that did get built is on the wrong side for this. But of course, there was no source for funding this, or the expected operating deficits CA&E would have had. 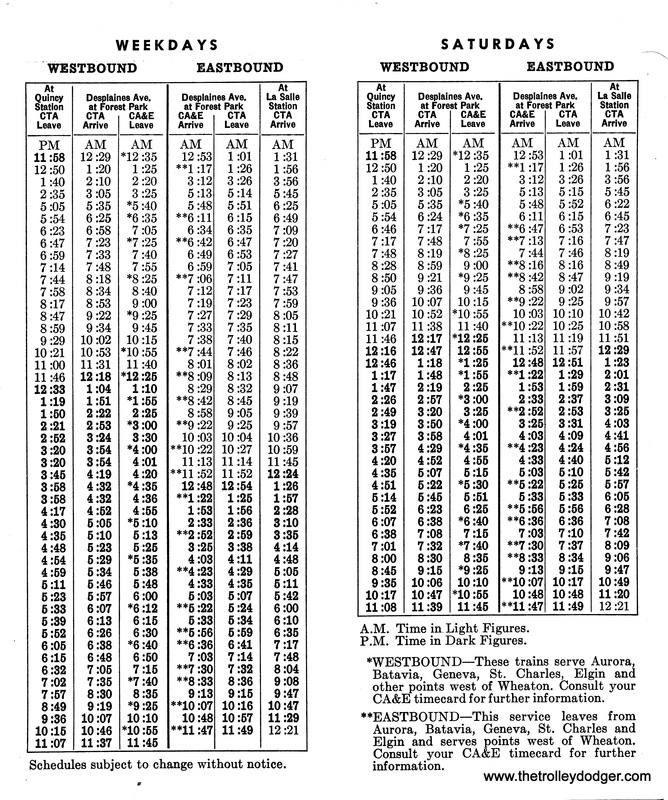 I was thinking in terms of a route to deadhead CA&E trains to the Humboldt branch, were the railroad to restart passenger service. 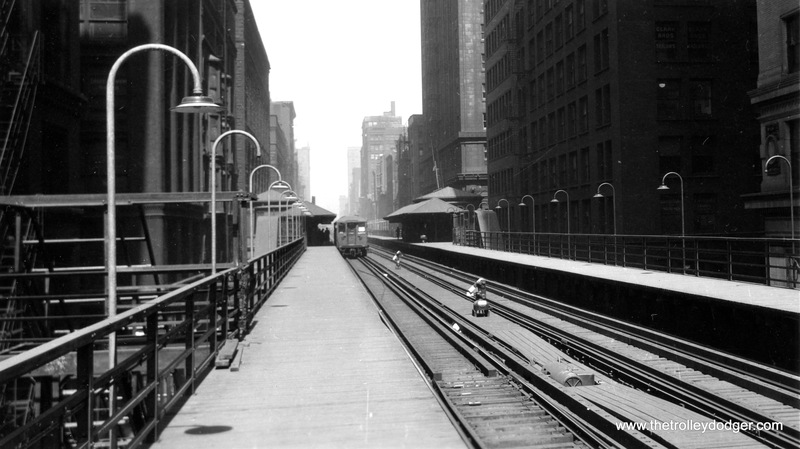 Given the potential capacity of the Milwaukee subway, I don’t see why they couldn’t have simply followed behind regular CTA trains. 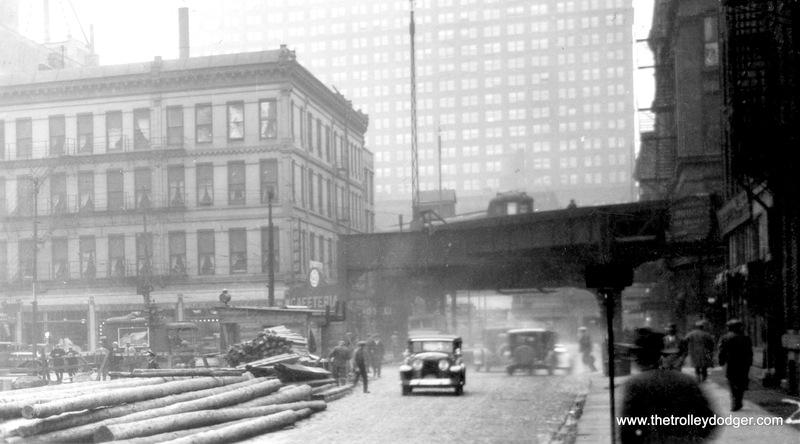 Assuming the CA&E stopped using wood cars, and their loading gauge was compatible with the Dearborn Street tubes. 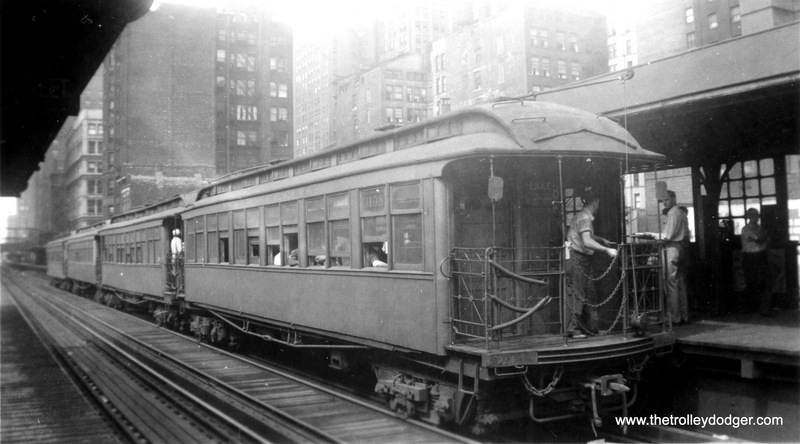 They were going to have to stop running wooden cars into the city, as they were not allowed in the subway. I don’t see why there would have been clearance issues in the subway. 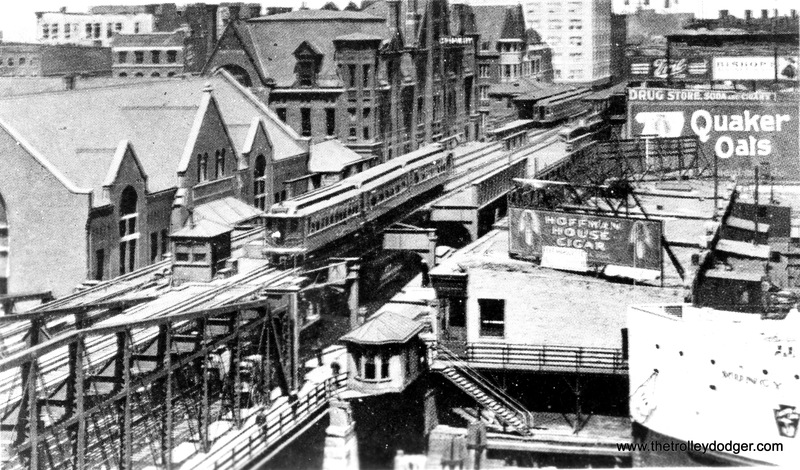 The overhead shot on Wells showing platform construction is early 20’s, when platforms were extended to accommodate longer trains. 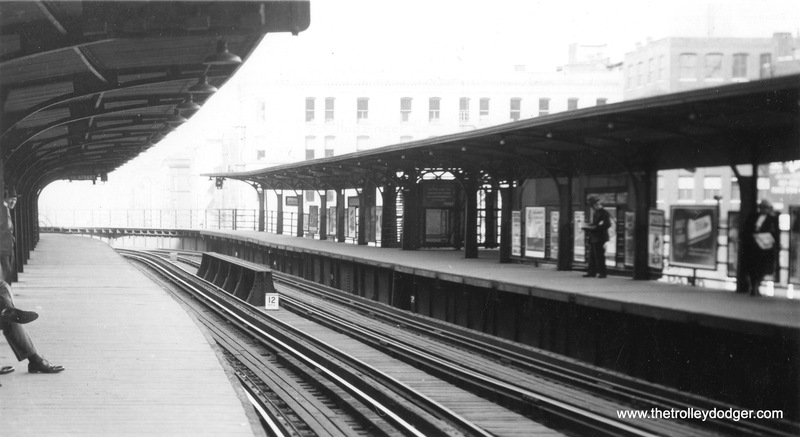 For instance Randolph/Wells and Madison/Wells were once separate platforms, after the early 20’s they were a continuous platform. 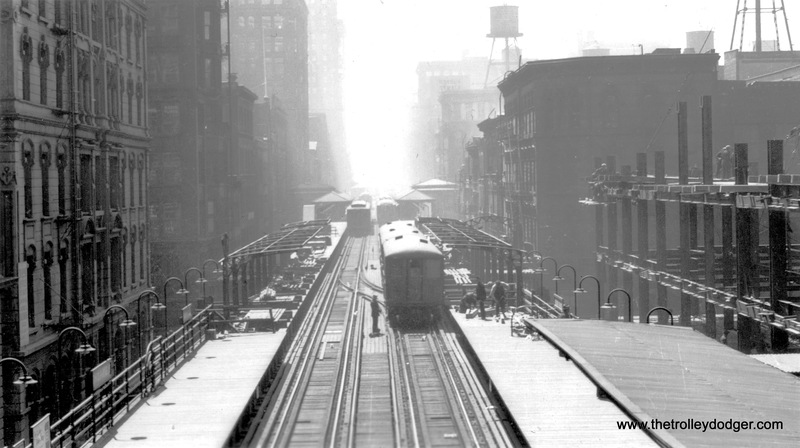 Also at that time, LaSalle/Van Buren and State/Van Buren were connected and the separate station at Dearborn/Van Buren became an auxiliary entrance to State, until a building next to it blew up in the very early 60’s and destroyed the Outer Loop side. 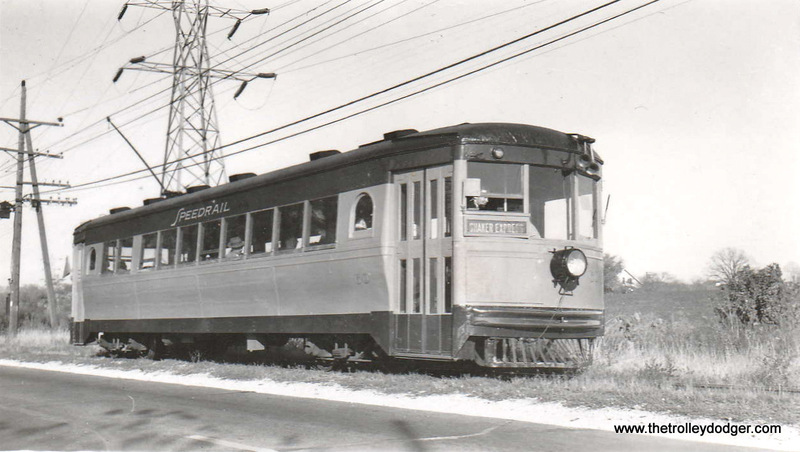 Regarding 144=225, the first photo in this post, I can definitively state that the fantrip featuring streetcar 225 dressed up as 144, occurred on Sunday, December 18, 1955. 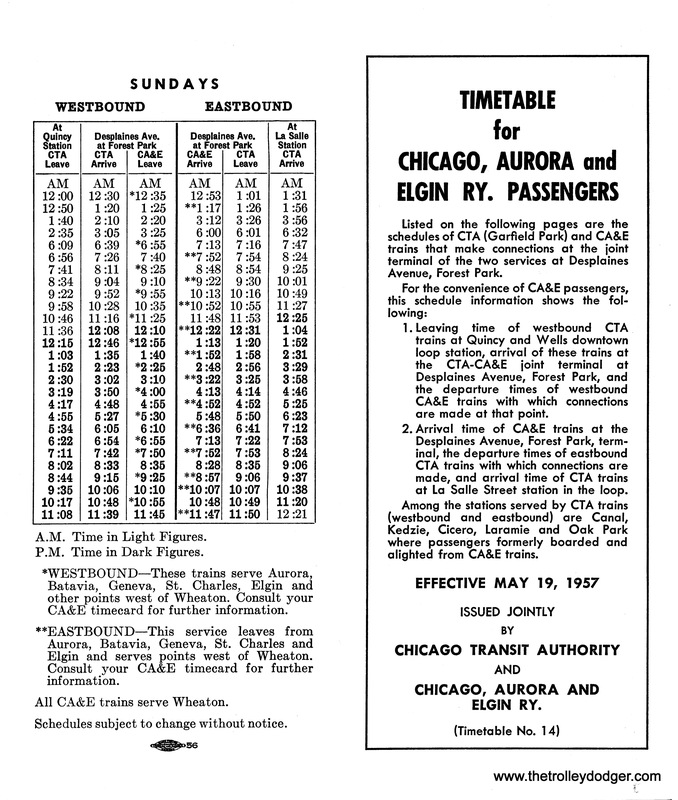 Since my original post on this subject, the front page of the Sun-Times of December 19, 1955 turned up. The photo of the car was accompanied by an article stating that the fans paid five dollars (imagine!) to ride the red car and they loved it. My very good friend Jeff Wien is noted as a stickler for detail, so I hope he reads this update and correction. Thanks… when I wrote that first blog post in 2013, the date I was given was 1956, but I see now that was incorrect. Unfortunately, I have no way to update the old article with the new date. 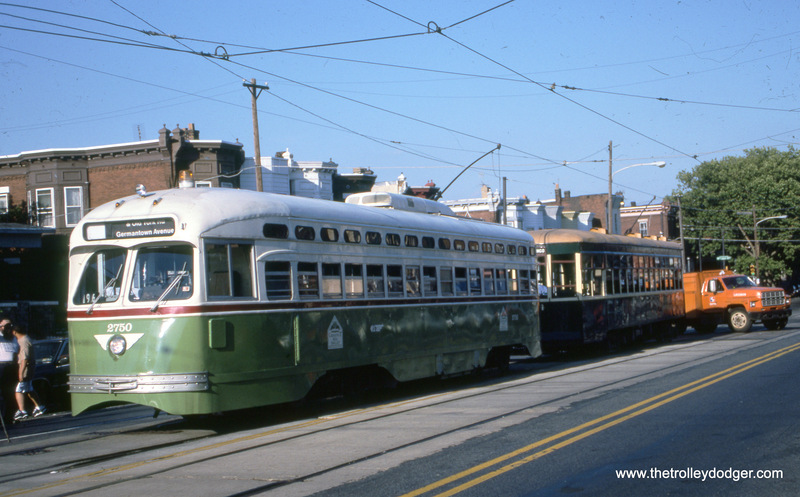 The photos of SEPTA 2785 on a fan trip appear to be taken a little earlier than the December 2002 date indicated. 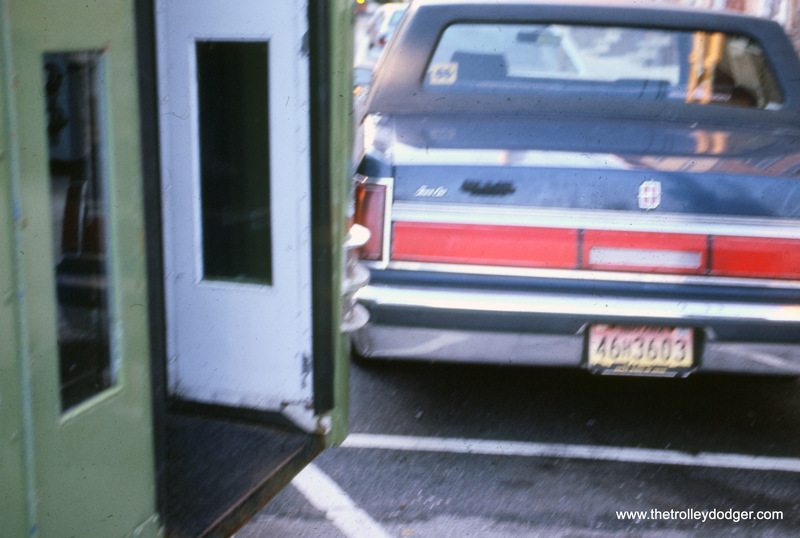 There was a lengthy fan trip using this car, along with SEPTA 2741 (since rebuilt into SEPTA PCC-II car #2325) in October 1998 which was a marathon of sorts, covering the system from Chestnut Hill to Eastwick, along with most of Route 15 as well as the surface car subway. 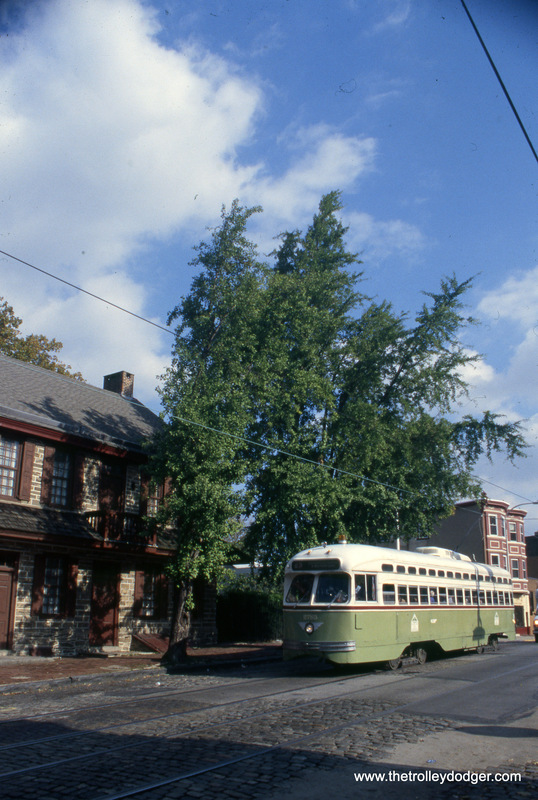 The photos posted look like they were taken on this trip, which was sponsored by two individuals who would later be among the founders of the Friends of Philadelphia Trolleys. The “three generation” photo of cars 8534, 2168, and 9074 was taken on a three car fan trip sponsored by the same individuals on April 18, 1999. 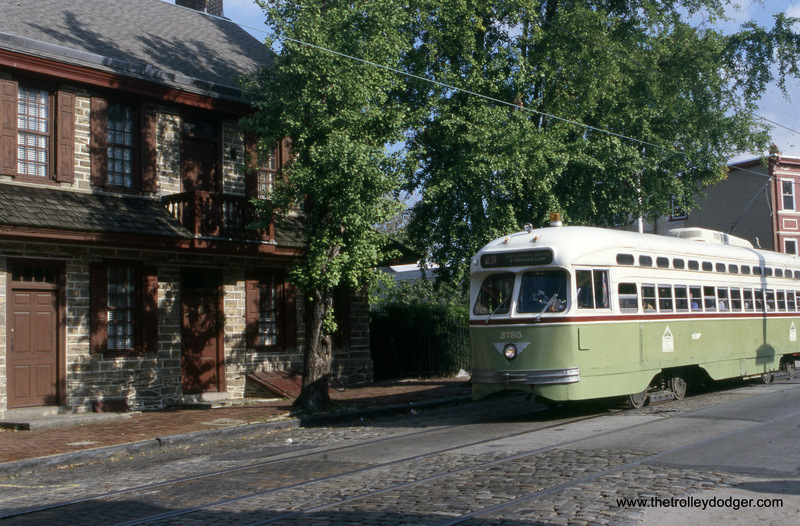 This was a well patronized fan trip with all proceeds donated to Pennsylvania Trolley Museum and Rockhill Trolley Museum. Thanks… the dates I had are when the slides were processed. Perhaps the film stayed in the camera for a while. 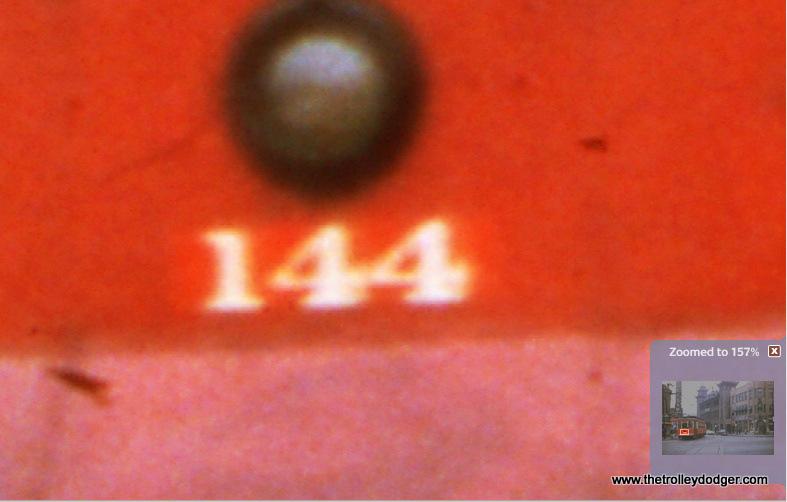 Interesting info on the #225 masquerading as the #144. A car we have in storage at the Seashore Museum. We have a car from Brooklyn that was renumbered to fool the scrapper just so we could save a Jewett! 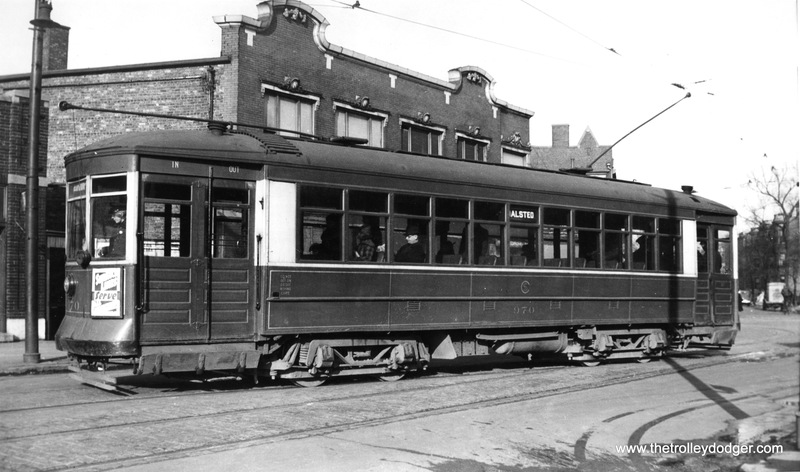 Regarding the old Logan Square L along Paulina – it was originally retained as it was the only physical connection between the Milwaukee Subway and the rest of the system. 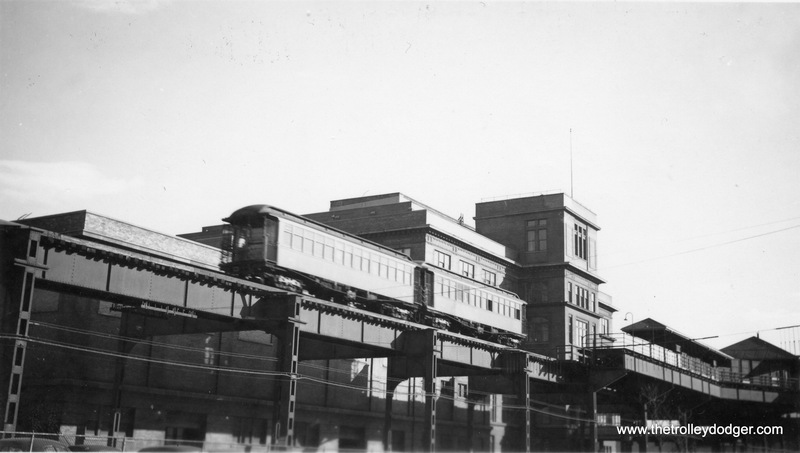 After 1958, it was kept so that work trains could go to Logan Square, since wooden cars, which the work motor fleet was composed of at the time, were not allowed in the subways. 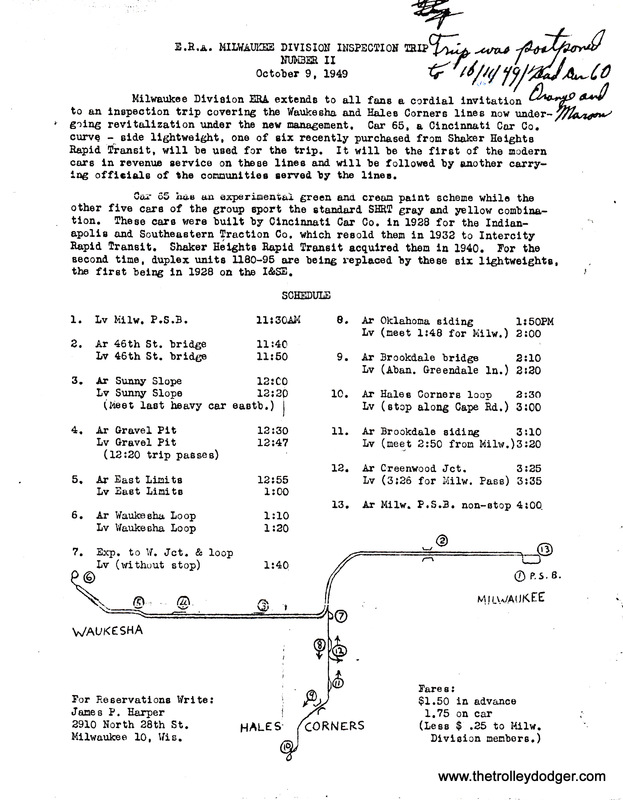 After 4000’s took over the work motor fleet, there was no more need for this route, except the section between Harrison and Lake which was still the only connection between the West-Northwest and the rest of the system. 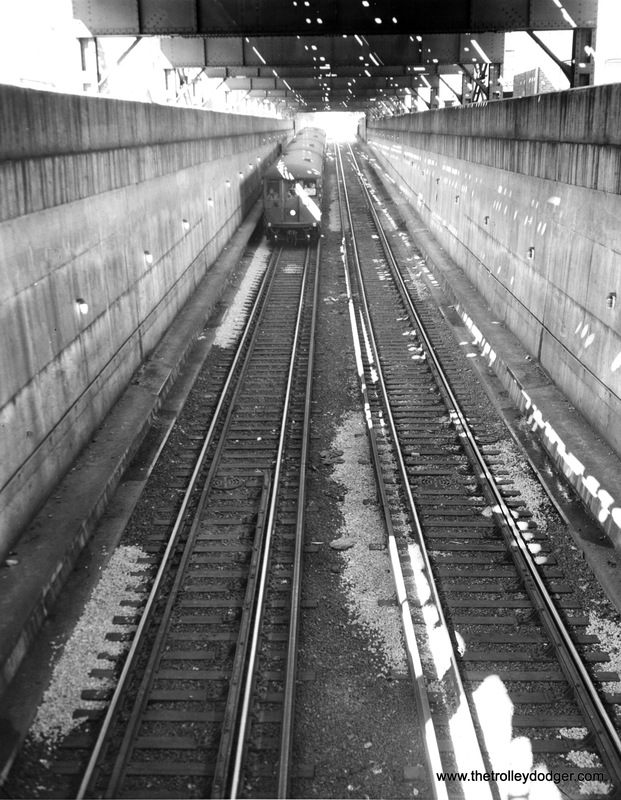 Besides, after 15 years of very minimal use and basically no maintenance, the line was getting pretty rickety. 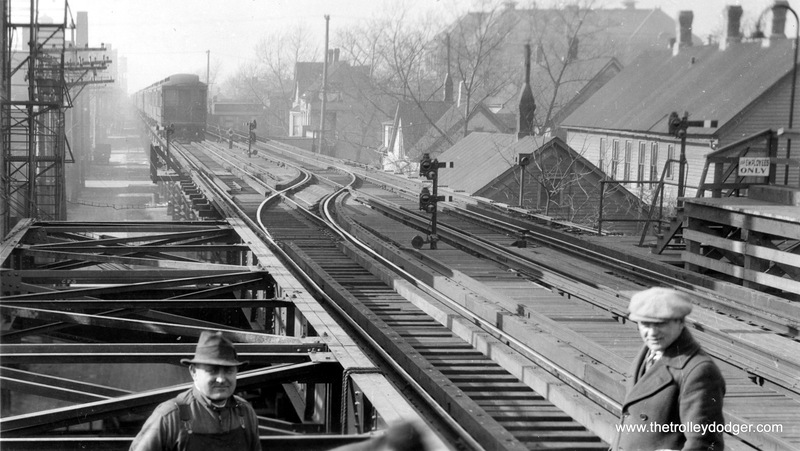 As far as wooden work motors in the subway, city ordnances or no, it did happen. 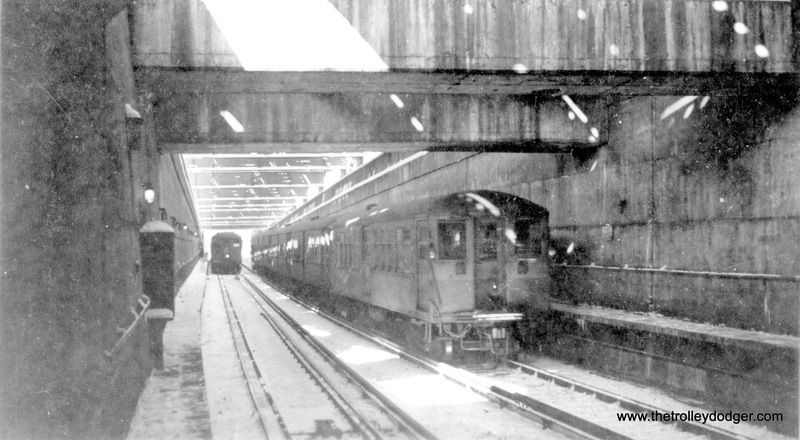 One late evening I personally saw two wooden work motors (17-1800 type) pulling the rail-smoothing “sled” at Lake Transfer in the Dearborn Subway southbound.